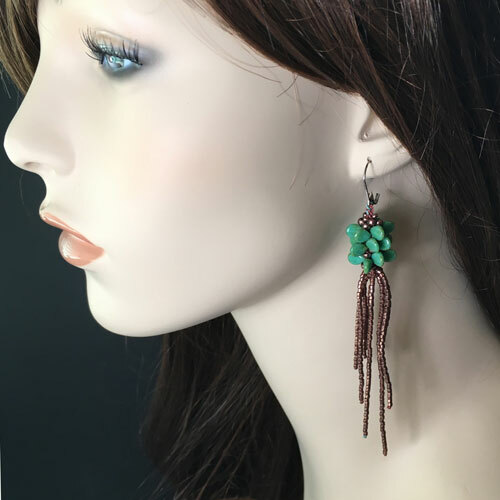 The PIP Jellyfish Earring Design has a kumihimo body with PIP beads, and a beaded tassel for the tentacles. The leverbacks findings are comfortable to wear. The earrings are light, easy to make and fun to wear. First I designed the PIP Bracelet Kit and Tutorial. 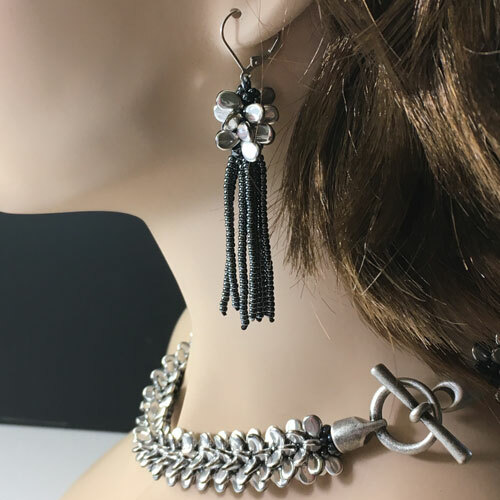 Afterwards I made a neckpiece to match to wear for a wedding, and then I needed earrings... so I set all my other projects aside and went to work designing my very first kumihimo earring design. Please note that I went about it without doing any research online whatsoever. I did not want to be influenced by someone else’s designs. 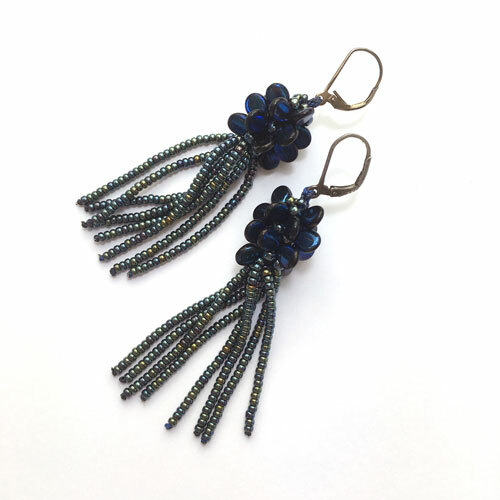 After a few false starts, everything gelled and the Kumihimo Jellyfish Earrings with PIP Beads were born! This project assumes you this is your second kumihimo project and that you already have a manual showing you how to braid and how to drop the beads. If not get a PIP Bracelet Kit and Tutorial. This kit comes with a 15 page copyrighted manual with 33 pictures, tables and charts. The PDF manual has clear and easy directions on how to make these earrings. The earring manual includes 3 kumihimo design variations. Design 1 is shown in the step by step. Design 2 is a shorter version, Design 3 a longer version. 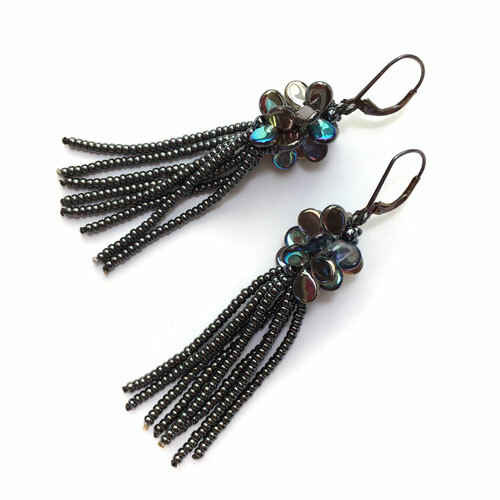 The beaded tassels can be made with Miyuki 11/0 Seed Beads or Delicas. 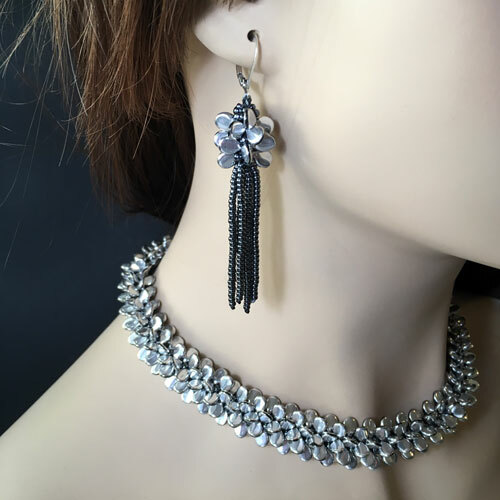 The kits include all the beads, the cut thread and the earring leverbacks. 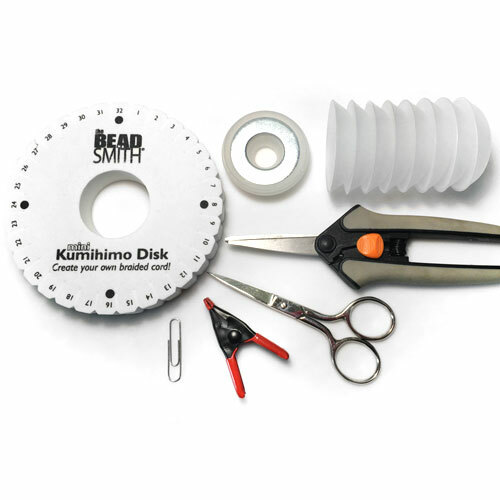 A Kumihimo Tool Bag, with a Thick Mini K-Disk, 8 EZ-Bobs, 1 Weighted EZ-Bob and 1 Mini-Clamp. Plus you will need Fray Check to make self needles. A thread burner is a great option to melt the cord ends. If you do not have one and do not want to purchase one, you can use Fray Check as a glue instead. A bead mat is recommended and included with the Deluxe Bag. The tutorial is also available by itself HERE. Preciosa PIP beads are perfect little petal shaped pressed glass beads with soft edges measuring 5x7mm. Each kit makes 1 pair of earrings approximately 2 7/8 inch (7.3 cm) long. The cords are pre-cut. The sterling and gold filled leverbacks passed the European nickel level test. Nickel is very allergenic and high levels are considered unsafe for jewelry. The kits listed below are high quality kits with high quality components. 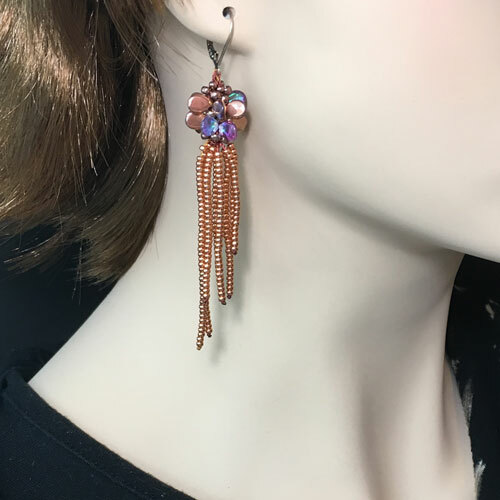 Dual coated PIP beads, transparent colors on one side, metallic copper on the other side... Design 2 has a shorter kumihimo body and brighter copper beads for the tassels. Design 3 has a longer body and darker copper Delicas for the tassels. Same as above but with 36 PIP Beads and 3.5 g of Miyuki Duracoat Delicas instead of most of the 11/0. All the tools for this kumihimo project in a bag... In addition you will need scissors, micro-tip pruning snip, Fray Check for self needles, plus an adhesive to attach the clasp such as Poly Zap Super Glue, Zap Jewelry Gel or Devcon 5-Minute Epoxy. A bead mat is recommended and included with the larger bag. Larger bag, plus a Bead Mat! 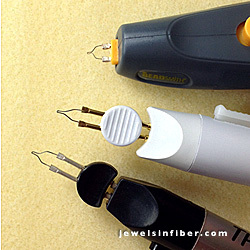 Perfect for self needles - superior to super glue or nail polish. It does not leave much of a residue on the fingers when smoothing along the thread, and the residue can be washed or rubbed away easily. The alcohol evaporates and the product dries on the thread. When opening the bottle for the first time, poke a hole in the tip with a fine pin. Allow 5-10 minutes to dry. 0.75oz./22.5 ml. Made in the U.S.
15 page PDF document with over 30 pictures, tables and charts. This will take you directly to a Paypal checkout payable with any major credit or debit card. Once your payment is complete you will be redirected to a web page with the link to the PDF and the password. Save the password and bookmark the page for future viewing. Please Note: These instructions are copyrighted and are for personal use only. If you would like to use these instructions to teach, either buy a set of instructions per student or a kit for each student. Do not duplicate this document either in print or in an electronic manner. When purchasing this PDF, it is assumed that you agree with the terms of the copyright of this document. As to earrings, make as many as you wish, but if you use the designs in the PDF as is, without any changes, assign the design credit to Marion Jewels in Fiber. Copyrights - These instructions are copyrighted. Do not duplicate the instructions either in print or in an electronic manner. These instructions are for personal use only. If you would like to use these instructions to teach, buy PDFs or kits for your students. When purchasing the kit or PDF listed above, it is assumed that you agree with the copyright terms of this document included in the kit. As to making bracelets or necklaces, make as many as you wish, but if you use the designs in the PDF as is without any changes, Marion Jewels in Fiber would appreciate design credit. Thanks for understanding!